Full QWERTY capabilities with 6 keys on the back! Build a small infrared remote control for the PC replacing the mouse and keyboard. There are many options from the remote below to a tiny matchbox sized device. See the demo! Check also the new GKOS project, the Universal GKOS IR Keyboard: Several applications, e.g. operate your MiniDisc player and enter song titles (no mouse). This website has been set up for those familiar with soldering and wishing to experiment with the new GKOS keyboard open standard (character set). Make a GKOS keyboard and connect it to your PC either using IR link or cables. Mouse functions are included. 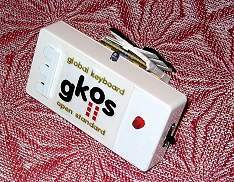 A GKOS keyboard connected directly to the printer port of the PC (Windows 3.1/95/98 only). A quick way just to test the GKOS keyboard concept. No pointer control. Braille mode. A GKOS keyboard connected to the PS/2 keyboard/mouse connector of the PC, using the popular PIC 16F876 microcontroller. Braille mode is not implemented yet. 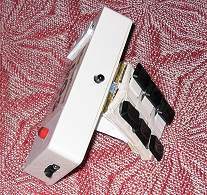 An infrared link can be used instead of the cable to have a remote control for the PC using a cordless pocket sized GKOS keyboard + mouse (see example in the figure above). Remote 1 uses a TrackPoint mouse. Remote 2 is much simpler to build and it uses a low-cost game control stick. The TrackPoint control has a much nicer touch but it is more tedious to build. 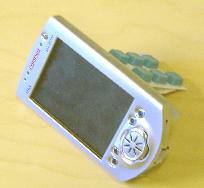 A small infrared remote control (keyboard only but including 'keyboard as mouse' operation) and the interface to the PC PS/2 mouse/keyboard connector. The interface can handle both mouse and keyboard signals for all types of GKOS remote controls. See the demo movie. MORE: See also gkos.com to learn more about the GKOS keyboard concept. FORUM: Visit the discussion forum on GKOS concept and the projects.